Multifuel - heat it with wood, gas, coal etc..
Firewood, coal, or other solid fuels take a bit longer than gas. The same burner is used. To heat the tub using firewood place the stainless steel grate in the burner and build a fire on it just as you would in a pot belly stove or woodburner. Long thin lengths of dry firewood are best, fed frequently. Coal can be added to give more heat. Once the fire is established, usually no smoke is observable from the flue, just shimmering air. Like an outdoor barbecue, it is acceptable under clean air regulations in New Zealand except for some specific central urban areas. Check with your local authority. Gas is acceptable in all areas. Fire safety: The copper waterjacket encloses the burning chamber so the belly of the burner sitting on the ground gets no more than warm (say 40°C (104°F) max. ), plus the flue cowl has a stainless steel mesh spark guard. However, if in doubt in dry conditions, run the burner on gas, not firewood. Heating time: This depends on the temperature of the water to start with, the dryness and type of wood, how good you are at making a fire, etc. Say two hours or so starting with cold (13°C (55°F) water to heat the tub to 38°C (100°F). The same burner also uses gas. Faster to heat the tub on gas than on firewood: can take less than an hour and a half. Uses 3 kg or so of LPG to heat tub usually: cost in NZ approximately NZ$6.00. To heat the tub on gas, just place the stainless steel tube burner (supplied) in the burning chamber and light the gas. The tube burner is a long slim stainless steel cylinder which puts out 127,000 BTUs (equiv. 32kW)/ hour of heat. The gas hose is stainless steel mesh with a Teflon inner lining, connected to a childproof regulator with POL fitting. Just screw into the outlet of a standard gas cylinder, usually 9kg (cylinder not supplied). When the tub is hot enough, just turn off the gas. It's that simple. The tub is extremely well insulated: the water will stay suitably hot for bathing for many hours. 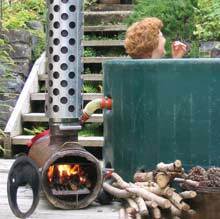 Time and Cost: Gas heats the tub faster than firewood. The time varies a bit depending on the initial temperature of the water, weather conditions, etc., but is usually well under two hours. Our record is 1 hour 25 minutes from 7°C (45°F) cold winter water to 40°C (104°F). This required 3 kg of gas, costing NZ$6.00. In northern New Zealand, the tub has been heating up in less than an hour, e.g. 45 minutes on Waiheke Island. Generally in the Southern winter, it will take about half a 9kg bottle of gas to heat the tub from cold and keep it hot to use for 2-3 days. In northern New Zealand, it's more like a third of a bottle. Most of the gas use is in getting the tub hot from cold. Once it is hot, turn the gas off and it'll stay hot all that evening; put the lid on and the next morning it'll take only 10-15 minutes on gas to get it up to bath temperature again. We've never had any problems, but the water should be emptied after 2-3 days of personal use. In a commercial situation, we recommend emptying it out the next day. Just fill with clean fresh water or seawater for your next soak.